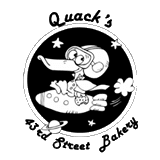 Quack's is the present incarnation of Captain Quackenbush's, Austin's first coffeehouse, established in 1983. When we first opened, seeing as we were the first coffeehouse, all of our coffee came from a roaster in new York, and our UPS driver HATED us, because he was dragging in 490 pounds of coffee every two weeks! Also, when we first opened, we didn't sell regular drip coffee, because we knew that if people had that choice, we'd never be able to sell them espresso. We had been open 10 years before we started selling drip coffee. After opening, we found that we needed to start baking operations in order to provide out customers with quality baked goods. From there, we developed a baking program and began to wholesale our products to other cafes and stores. We have now expanding again with our Cakery, to handle custom decorated cakes and cookies. What's your favorite part of Quacks. It's like trying to pick your favorite child. Our decorated cookies show off a great deal of the creativity and talent possessed by the decorators, and the cookies are very entertaining. Also, the whole notion of a coffeehouse, which we try to preserve, is that it's a place for the free expression of ideas. It's a social gathering where people can change ideas and learn from one another. Quack's was setup to be a hangout. Some of our customers who came to original location still come here 30 years later. We get introduced to the children and grandchildren of our original patrons. Quack's was renamed, because that's what people were calling it. What's the funniest story you have about this place? I came here from Berkeley, CA. Initially, when i was out here looking for housing, I was recommended to a french bakery that my real estate agent knew of. It was called La Bastille bakery and it was located on Manor. What I didn't know, until I visited, was that the "bakery" was located in an apartment complex that was clothing optional! Fortunately, the bakers wore clothes! They had combined two one-bedroom apartments to bake in! I don't know how they got by the health department with that, but they did. The epilogue is when their bakery went out of business, one of the bakers came to work for us!